Sometimes it may be difficult to discover problems with your car. Other times, as with the case of squeaky brakes, your vehicle is literally calling out to you for help. It goes without saying that the integrity of your car’s brakes is crucial to on-road safety. That said, problems with your vehicle’s brakes definitely shouldn’t be ignored. So, if you’re noticing a squeaking sound coming from your vehicle’s brakes, here are a few reasons they may be doing so. If you’re driving an older vehicle, a squeaking sound while braking can signal that your vehicle’s brake pads are beginning to wear out. The squeaking is created by metal pads within your brake pad that are revealed as the pads wear down, giving you a warning before they wear down completely and begin to cause damage to your rotor. Over time, your car’s rotors can lose their smoothness, which is another common cause of brake squeaking. Rust and other debris can cause the squeaking noise. If this is a problem on your vehicle, the rust or dirt can be filed off by your local mechanic. Sometimes slamming on the brakes is unavoidable. Whether another car pulls out in front of you, or you’re a bit slow to react to stopped traffic. Braking hard causes your brake pads to wear down more quickly as well as causes heat to warp your brake discs and rotors – all of which cause your brakes to start squeaking. 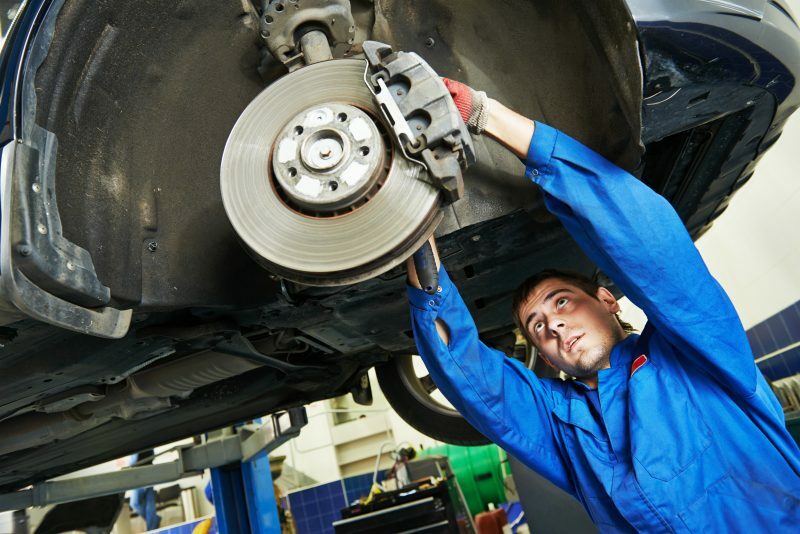 Overall, noticing squeaking brakes from your vehicle is a sure sign that it’s time for an inspection and service. When your car’s brakes aren’t performing at their best, the risks can be extremely high. Visit our expert service department here at Godwin Motors to set up an appointment to have your brakes checked and repaired if needed. This entry was posted on Tuesday, October 9th, 2018 at 7:23 pm	and is filed under Godwin Service Center, Tips and Tricks. You can follow any responses to this entry through the RSS 2.0 feed. You can skip to the end and leave a response. Pinging is currently not allowed.